strokeofluck: REFUGEES OR CRIMINALS--CHARGE THEM WITH ARSON--SEND THEM TO JAIL--THEN DEPORT THEM! REFUGEES OR CRIMINALS--CHARGE THEM WITH ARSON--SEND THEM TO JAIL--THEN DEPORT THEM! I have always had empathy for the plight of refugees, however the behaviour of a certain detainees should not be tolerated. If they break the law they should be treated as criminals, sent to jail and deported when they have served their sentences. We are just about to deport a person who has been in Australia for 40 years, because he has a criminal record, why don't we deport refugees who break the law. Arson is a serious offence and should be treated as such. 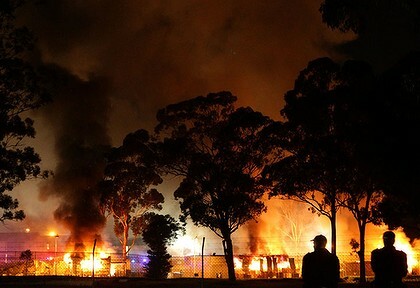 100 detainees set fire and destroyed at least nine buildings at Sydney’s Villawood Detention Centre last night. The trouble started in the Fowler complex of the centre in Sydney’s south-west around 10pm last night. Flames from the fire rose to more than 10 metres high. Firemen risked their lives to put the fire out and it cost $100,000s of dollars to build, for the benefit of the refugees detained there. I'm sure the majority of refugees were not involved, which is why we should treat the instigators as criminals, because thats what they are. Stop pussyfooting around, send them to jail, they broke the law! !